What an amazing ceremony! It’s so interesting that he was made King, and could potentially have seized so much power, but the marriage didn’t last. What did actually happen? Did Philip just go back to Spain and was the marriage ever annulled? Hi Jo, Mary was Philip’s second wife and he actually only spent a few months in England during the marriage. Mary I died in November of 1558 while Philip was in the Netherlands. He did go back to Spain and married again twice. His third wife was Elizabeth de Valois, the daughter of King Henri II of France and Catherine de’Medici. She died after nine years of marriage. His fourth wife was his own niece Anna of Austria, the daughter of his sister. This last marriage has a little bit of the “ew” factor but he was truly the happiest with her. I liked your question & Ms. Abernethy’s answer (system seldom allows me to “like” anymore). I think there were a lot of caveats written into the marriage contract that would not allow Phillip too much real power. Had they managed to have a living heir, he might have been able to exert more influence. Years later, when William III and Mary II reigned, the provisions of joint sovereignty allowed William to rule alone after Mary’s death. However, William was himself a more distant contender to the throne, which might have eased Parliament’s objections. I might be comparing cheese to chalk to even bring W&M into this consideration. But I do know W&M’s contract was carefully constructed by Parliament to preserve the Church of England’s Protestantism. It was also instituted long after the two were married, so were not part of marriage provisions. I think Parliament’s power was more circumscribed in Mary I’s reign, but more influential than in Henry VIII’s. Much was done in Edward VI’s weak reign to bolster Parliament’s influence. Thank you, Shaun! I wonder if Phillip himself was hoping to get around those caveats, or if he had hoped for an heir who would do it for him. That is a very interesting ‘what if’ situation! It’s important to remember that Phillip married not out of love, but for dynastic advantage. I have no doubt there were mighty wranglings between Phillip’s council, Mary’s council, & Parliament so that no sneaky takeovers could occur. It was probably a blessing to Europe that no healthy heir came of the union. Being the father of a future English/Spanish monarch in those days of near-absolutism could have made Phillip one of the most powerful men in history. The what-ifs are staggering! Remember; Scotland was not yet part of the domain. Imagine Mary’s & Phillip’s child handling Mary Queen of Scots? It could have resulted in a catastrophic war with France, due to the Auld Alliance. Parliament & Mary had good reason not to give too much power to the King-who-was-not-quite-a-king! Every detail was loaded with significance! Amazing how the rituals managed to cross every “t” & dot every “i” of protocol. Leave anything out & it could be a disaster to political stability! A king, and yet not the King! I bet that took some fancy wordsmithing! 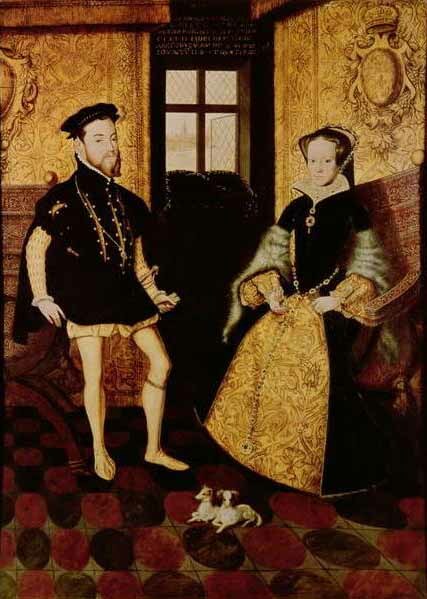 In the double portrait, painted by a skillful artist (I recognize Mary’s face from another picture) Philip’s legs look awfully disproportionate. Did he suffer from a malformation? Not that I know of Iva. I just think it was the artist was off in his perspective. Looks like someone started the picture and someone else, less talented, finished it. Interesting to me is that the documents were in both English and Latin and a commentary was given in both languages. Is this new—having translations? I wonder how long it took to plan the wedding and make sure everyone knew where they were supposed to be.